When it’s time to inspect your home for a major change, there’s no better tool than the Home Inspection Checklist. This free template has features to help you organize your home into different sections, then use simple marks to know exactly what needs to be fixed. You can use this template to make an accurate assessment of your home when you need to move or get an appraisal. You’ll have everything you need to get started, whatever your future home goals you have in mind. To use this free template, just follow the set of instructions that have been illustrated below. To download the free template file, just scroll to the bottom of this page and follow the link provided for you. Now, you will start by entering your address and the date of the inspection at the top of the page. There are lines provided for this purpose. 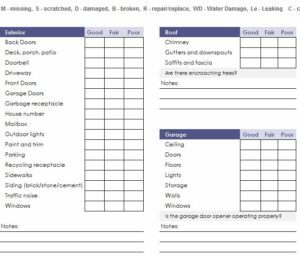 When you start to use the template, you’ll see the areas of a common home have their own tables, with a system for the condition of each item. You will be given the options for good, fair, and poor status. These sections also list examples of common items found in each room. The “Kitchen” area of the template will have a “sink” listed, for example. When you inspect an area of your home, you will use the items of the legend above to indicate the issue. You can just place that letter under the correct condition of the item. For example, let’s say during your inspection of the garage ceiling, you noticed some damage. You would then go to the “Garage” table and in the ceiling section; you would enter a “D” for damaged. That letter would go beneath one of the appropriate condition options that you see displayed. Using this same method, you will go through the entire home and make sure everything is perfect!